Background Our objectives were to: (1) examine the occurrence of labour induction, caesarean section, and operative vaginal delivery in women with intellectual and developmental disabilities compared to those without and (2) determine whether pre-pregnancy health conditions and pregnancy complications explain any elevated occurrence of these interventions. Methods We conducted a population-based study using linked Ontario (Canada) administrative data. We identified deliveries to women with (N=3932) and without (N=382 774) intellectual and developmental disabilities (2002–2011). Modified Poisson regression was used to estimate adjusted relative risks (aRR) and 95% CIs for interventions, controlling for sociodemographic characteristics. We used generalised estimating equations to determine whether pre-pregnancy health conditions and pregnancy complications explained any statistically significantly elevated aRRs. Results After controlling for socio-demographic characteristics, women with intellectual and developmental disabilities were more likely to have labour inductions (aRR, 1.13; 95% CI 1.06 to 1.20) and caesarean sections (aRR, 1.09; 95% CI 1.03 to 1.16) but not operative vaginal deliveries, compared to the referent group. Pre-pregnancy health conditions explained 12.9% of their elevated aRR for labour induction. Pre-pregnancy health conditions and maternal complications explained 27.8% and 13.3%, respectively, of their elevated aRR for caesarean section. Conclusions Women with intellectual and developmental disabilities are slightly more likely to have labour inductions and caesarean sections than women without intellectual and developmental disabilities. The elevated occurrence of these interventions is not fully explained by their pre-pregnancy health conditions or pregnancy complications. Non-medical issues should be evaluated for their influence on the timing of labour and delivery in this population. Labour and delivery interventions such as labour induction, caesarean section and operative vaginal delivery are intended to optimise the health of the mother and fetus in the presence of pre-pregnancy health conditions or pregnancy complications.1–3 However, these interventions are not without risk. Poor maternal outcomes include postpartum haemorrhage, major puerperal infection, and mortality;4 ,5 poor neonatal outcomes include need for oxygen supplementation and mortality.4–6 Therefore, increasing rates of labour and delivery interventions, especially in developed countries, are concerning.7 ,8 There is a need to identify vulnerable groups in which the occurrence of these interventions may be elevated. Women with intellectual and developmental disabilities (IDD) may be one such group. These women experience a range of cognitive and adaptive impairments9 and have higher rates of chronic health conditions than women without IDD.10 Many have planned or unplanned pregnancies,11 and they have higher rates of pregnancy complications, including pre-eclampsia/eclampsia and fetal growth restriction.12–15 These complications may increase their need for labour and delivery interventions. However, no studies have examined labour induction, and the few that have examined caesarean section and operative vaginal delivery are inconclusive. A retrospective cohort study from the USA found that women with IDD (N=703) were more likely than those without to have caesarean sections (relative risk RR, 1.3; 95% CI 1.2 to 1.5).13 A Swedish retrospective cohort study (N=340 with IDD) found similar results (adjusted OR, 1.6; 95% CI 1.2 to 2.2).14 In contrast, a retrospective cohort study from the UK (N=217 with IDD) found that the occurrence of caesarean sections (9.3% vs 7.5%, p=0.32) and forceps deliveries (13.5% vs 13.1%, p=0.88) were elevated but non-significant among women with IDD.16 In all studies, consideration for confounding variables was limited. The objectives of this study were to: (1) examine the occurrence of labour induction, caesarean section and operative vaginal delivery in women with IDD compared to those without and (2) determine whether specific, identifiable pre-pregnancy health conditions and pregnancy complications explain any observed elevated occurrence of these labour and delivery interventions. This was a population-based retrospective cohort study conducted in Ontario, Canada. Ontario is Canada's most populous province, with over 13 million residents and 140 000 births each year.17 Ontario residents have access to universal healthcare coverage, including all prenatal and delivery care. The current study included obstetrical deliveries with an estimated date of conception in fiscal years 2002 to 2011. Data were accessed from the Institute for Clinical Evaluative Sciences (Toronto, Ontario), an independent, non-profit organisation that holds data gathered from healthcare encounters of Ontario residents. Sociodemographic, administrative and clinical data in these databases were linked at the person-level using a unique encoded identifier and were analysed at the Institute for Clinical Evaluative Sciences. We used several databases to identify IDD: the Ontario Health Insurance Plan database (physician billing codes), the Ontario Mental Health Reporting System (psychiatric hospitalisations), the Canadian Institute for Health Information Discharge Abstract Database (non-psychiatric hospitalisations), and the National Ambulatory Care Reporting System (emergency department visits, day surgery, outpatient clinic visits) as well as information on disability support programme recipients from the Ontario Ministry of Community and Social Services.18 We used the MOMBABY data set, derived from the Canadian Institute for Health Information Discharge Abstract Database, to identify obstetrical deliveries to women with and without IDD and to estimate date of conception using gestational age at delivery (based on first trimester ultrasound in 69.8% or last menstrual period).19 We used the health administrative databases described above and the Registered Persons Database (birthdate, postal code) to derive the outcomes and covariates. We derived our sample from a larger cohort created using linked health and social services administrative data, in which all individuals aged 18–64 years with IDD in Ontario were identified as of 1 April 2009.18 Individuals were classified as having IDD if they had a relevant diagnostic code recorded in health administrative data since inception of each database (≥2 physician visits since 1992 or ≥1 emergency department visit or hospitalisation since 2000 or 1988, respectively) or in disability support programme documentation.18 IDD encompass a number of disabilities characterised by significant cognitive and adaptive limitations (eg, intellectual disability as defined in the Diagnostic and Statistical Manual of Mental Disorders, 5th edition) as well as those which have adaptive impairments but varied cognitive ability (eg, developmental disabilities such as autism). Therefore, included diagnoses were intellectual disability, fetal alcohol syndrome, chromosomal and autosomal anomalies, and pervasive developmental disorders; a full list of codes is available in a previous publication.21 The conceptual definition of IDD underlying these diagnoses is consistent with previous research, with widely used clinical definitions,22 and with Ontario legislation.23 For the current study, we identified, among all women with IDD aged 18–49 years, all singleton obstetrical deliveries of live born or stillborn infants (>20 weeks gestation) whose estimated conception date was between 1 April 2002 and 31 March 2012 (N=3932 deliveries). As a referent group, a simple random 20% sample of obstetrical deliveries to Ontario women without IDD during the study period was included (N=382 774 deliveries). The sample size for the referent group was chosen to maximise study power and minimise computing requirements. In line with previous research,30 we considered confounding variables to be factors distal to the outcomes of interest, that is, sociodemographic characteristics. Potential mediators included pre-pregnancy health conditions and pregnancy complications; for pregnancy complications, we selected factors that are considered to be medical indications for labour induction, caesarean section and/or operative vaginal delivery according to clinical practice guidelines established by the Society of Obstetricians and Gynaecologists of Canada and the National Institute for Health Care Excellence1–3 (see table 1). For our second objective, we conducted mediation analyses by using generalised estimating equations to test the statistical significance of the difference in coefficients between a full model (with the mediator) and a reduced model (without the mediator).33 This difference in coefficients represents the indirect effect of the exposure, through the mediator, on the outcome. Because mediation requires statistically significant associations between exposure and outcome and between exposure and mediator,33 we conducted these analyses for (A) labour and delivery interventions that were statistically significant in the main multivariable models and (B) potential mediators that were more common in women with IDD compared to those without. For this latter criterion, we used Pearson's χ2 tests with Bonferroni-corrected p values. Potential mediators were then aggregated into composite variables (ie, pre-pregnancy health conditions, maternal complications, placental complications, and fetal complications) and entered into the mediation analysis one by one. Statistically significant mediation analyses were then followed up by investigating the individual factors accounting for the pathway. All mediation analyses controlled for the same confounding variables as the multivariable models. SAS V.9.2 (SAS Institute Inc, Cary, North Carolina, USA) was used for statistical analyses. There were 3932 deliveries to 2584 women with IDD and 382 774 deliveries to 260 700 women without IDD during the study period (fiscal years 2002 to 2011). Women with IDD were more likely than those without to be less than 20 years old, to live in the lowest neighbourhood income quintile, and to reside in rural regions (<10 000 residents per km2) (see table 2). Women with IDD, compared to those without, had higher rates of the following pre-pregnancy health conditions: pre-existing diabetes mellitus, herpes or HIV, epilepsy, and psychiatric disorders. Among maternal complications, they had higher rates of pre-eclampsia/eclampsia, venous thromboembolism and chorioamnionitis. Among placental complications, they had higher rates of placental abruption and antepartum haemorrhage. Among fetal complications, they had higher rates of fetal death and fetal growth restriction (see table 2). Women with IDD, compared to those without, had elevated occurrence of labour inductions (24.6% vs 21.5%) and caesarean sections (28.0% vs 27.3%) but not operative vaginal deliveries (9.6% vs 10.3%). After controlling for confounders, they remained more likely to have labour inductions (aRR, 1.13; 95% CI 1.06 to 1.20) and caesarean sections (aRR, 1.09; 95% CI 1.03 to 1.16) (see figure 1). Adjusted risks of labour and delivery interventions among obstetrical deliveries to women with and without IDD. Multivariable model adjusts for maternal age, parity, neighbourhood income quintile and rural residence. IDD, intellectual and developmental disabilities. Women with IDD, compared to those without, were more likely to have one or more pre-pregnancy health conditions (55.9% vs 30.2%) and maternal (4.0% vs 2.5%), placental (7.1% vs 5.2%) or fetal complications (18.7% vs 12.6%). Pre-pregnancy health conditions explained 12.9% of the elevated aRR for labour induction among women with IDD. Psychiatric disorders were the most important variable in this pathway, explaining 9.3% of the aRR. None of the pregnancy complications explained the elevated aRR for labour induction among women with IDD (see table 3). Pre-pregnancy health conditions explained 27.8% of the elevated aRR for caesarean section among women with IDD. Psychiatric disorders were the most important variable in this pathway, explaining 18.2% of the aRR. Maternal complications explained 13.3% of the elevated aRR for caesarean section among women with IDD. Pre-eclampsia/eclampsia was the most important variable in this pathway, explaining 6.7% of the aRR. None of the other pregnancy complications explained the elevated aRR for caesarean section among women with IDD (see table 4). 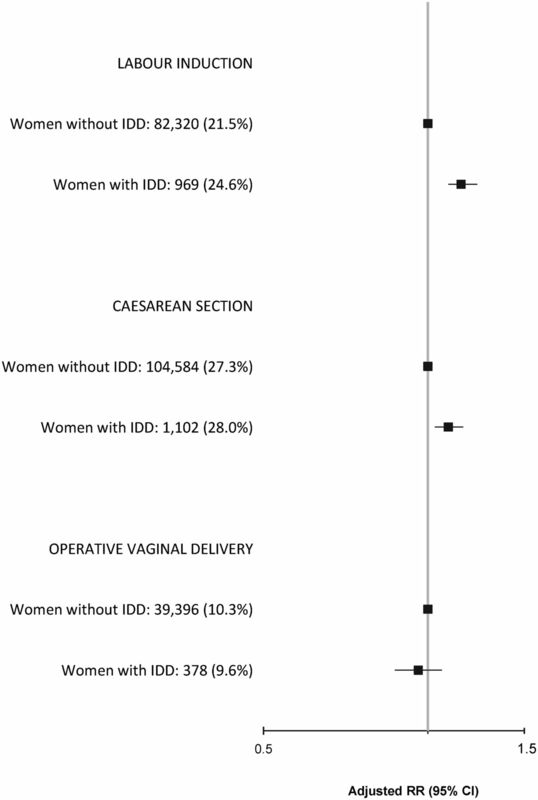 We found that women with IDD, compared to those without, were slightly more likely to have labour inductions and caesarean sections but not operative vaginal deliveries. Pre-existing health conditions and maternal complications explained some of the elevated occurrence of labour inductions and caesarean sections. Specifically, psychiatric disorders (ie, mood, anxiety, psychotic and substance-related disorders) and pre-eclampsia/eclampsia were important mediators. However, these measured variables explained only a small percentage of the elevated occurrence of labour and delivery interventions among women with IDD, suggesting that other contributors play a role and should be studied. Our objectives required a large sample that is representative of women with IDD. Therefore, a strength of our study was the use of linked health and social services administrative data to identify women with IDD. This allowed for more complete capture of disability status than can be attained with health administrative data alone.18 The resulting population-based cohort of women with IDD is the largest described in the published literature to date.18 This large sample size allowed for mediation analyses. Moreover, by using health administrative data, we were able to reliably capture information on multiple pre-existing health conditions and pregnancy complications known to be associated with labour and delivery interventions,1–3 making these mediation analyses clinically relevant. There are some limitations that affect all studies using administrative data. It is well-established that some IDD are invisible to the healthcare and social services systems.34 It is possible that not all women with IDD were identified;18 such misclassification would likely bias estimates toward the null. However, the Ontario prevalence of IDD established by our research group (0.8%) is consistent with previous research (1%).18 ,35 IDD include a heterogeneous group of conditions; however, rather than examining specific conditions, we felt it was more pertinent to use a policy-relevant definition.23 Among women with IDD, data on disability severity, living situation (eg, group home, with family or independent), and whether or not the pregnancy was planned were unavailable. We also lacked information on ethnicity and could not identify whether or not women in our cohort were Aboriginal. These factors could contribute to labour and delivery interventions and may be of interest to study in the future. Finally, administrative data do not capture information on the course and severity of pre-pregnancy health conditions or pregnancy complications;36 such information would have been useful for discerning clinical decision-making behind the examined pathways. No previous studies have examined the occurrence of labour induction in women with IDD. Our study makes a contribution to the literature by showing an elevated occurrence of labour inductions in this population. Only three studies have examined the occurrence of caesarean sections in women with IDD.13 ,14 ,16 While our findings are consistent with those of the American13 and Swedish14 studies, the magnitude of the effect in our study was smaller. This difference could be because our study sample was more representative due to the use of linked health and social services administrative data or because we controlled for important confounding variables. The non-significant association reported by the study from the UK is likely explained by its small sample size.16 Like this latter study,16 we did not find an elevated occurrence of operative vaginal delivery among women with IDD. These previous studies hypothesised that labour and delivery interventions in this population were explained by pre-existing health conditions and pregnancy complications.13 ,14 Until now, this assertion had not been formally tested. Our study adds to the literature by showing that these factors explain only a small percentage of the slightly elevated aRRs for labour induction and caesarean section in this population. According to clinical practice guidelines,1–3 IDD are not a medical indication for labour and delivery interventions. We found that pre-existing health conditions and pregnancy complications, most importantly psychiatric disorders and pre-eclampsia/eclampsia, explained some of the observed increased occurrence of labour induction and caesarean section in this population. Psychiatric disorders can reduce pain threshold or impair uterine contractility;37 these impediments may increase the likelihood of decisions for labour induction or caesarean section initiated by patients or healthcare providers. Pre-eclampsia/eclampsia may result in medically indicated delivery in the presence of worsening maternal or fetal health.1 ,2 However, the majority of the elevated occurrence of labour induction and caesarean section among women with IDD was not explained by these mediators. It is possible that our data did not capture some medical issues which could result in the decision for labour and delivery interventions. It is also possible that healthcare provider decisions regarding labour and delivery in this population are influenced by non-medical issues. In some cases, women with IDD may have difficulties understanding the phases of labour or communicating their needs.38 In others, healthcare providers may assume that labour and delivery will be difficult because of the disability.39 These factors may lead to a preference to control the timing of labour in women with IDD. Women with IDD had only slightly elevated occurrence of labour inductions and caesarean sections. However, given the potential maternal and neonatal morbidity associated with these labour and delivery interventions,4–6 any elevated occurrence should be addressed. Our study has implications for women with IDD and the healthcare providers who support them before, during, and after pregnancy. High rates of pre-existing health conditions and pregnancy complications in this population suggest that their health should be optimised prior to pregnancy. While not all conditions are modifiable, there may be risk factors, including lifestyle behaviours (eg, smoking, diet) and control of chronic health conditions (eg, psychiatric disorders) which could be targeted. Improved health could reduce the likelihood of medically indicated labour and delivery interventions. During pregnancy itself, there may be opportunities to reduce the chances of labour and delivery interventions through education of women and their healthcare providers. Patient education about the labour and delivery process has been shown to reduce distress among women with IDD.40 Healthcare providers should be aware that instructions during labour and delivery, particularly surrounding informed consent for interventions, should be accessible to women with IDD.39 While previous research has shown that women with IDD have a similar number of prenatal care visits as those without,9 ,12 it is possible that the nature of these visits is inadequate to support their unique needs. Improvements in the surveillance and modification of risk factors as well as enhanced provider–patient communication could reduce the likelihood of labour and delivery interventions in this population. Women with IDD are slightly more likely to have labour inductions and caesarean sections than women without IDD after controlling for sociodemographic characteristics. The elevated occurrence of these labour and delivery interventions is not fully explained by their pre-pregnancy health conditions or pregnancy complications. Non-medical issues, including healthcare provider assumptions and maternal difficulties with communication or comprehension, should be evaluated for their influence on healthcare provider decisions regarding the timing of labour and delivery among women with IDD. Women with intellectual and developmental disabilities have high rates of pre-pregnancy health conditions and pregnancy complications that may necessitate labour and delivery interventions. However, no studies have examined the occurrence of labour induction, and few studies have examined the occurrence of caesarean section and operative vaginal delivery in this population. Women with intellectual and developmental disabilities have slightly increased risks for labour induction and caesarean section that are not fully explained by their pre-pregnancy health conditions and pregnancy complications. Other factors, including maternal difficulties with communication and comprehension, should be evaluated for their influence on the need for labour and delivery interventions among women with intellectual and developmental disabilities.
. Induction of labour. J Obstet Gynaecol Can 2013;35:S1–18. National Institute for Health and Clinical Excellence. Caesarean section. UK: National Institute for Health and Clinical Excellence, 2012.
. Guidelines for operative vaginal birth. J Obstet Gynaecol Can 2004;26:747–53.
. Maternal and neonatal morbidity among nulliparous women undergoing elective induction of labor. J Reprod Med 2011;56:25–30.
. Women with disabilities aging well: a global view. Baltimore, MD: Paul H. Brooks Publishing Co., Inc., 2004.
. Pregnancy in women with intellectual and developmental disabilities. J Obstet Gynaecol Can. In press. Statistics Canada. Live births and foetal deaths (stillbirths) by place of birth (hospital and non-hospital), Canada, provinces and territories, annual; Statistics Canada 2006. http://estat.statcan.gc.ca/cgi-win/CNSMCGI.EXE (accessed 7 Jul 2014).
. Summary of studies on the quality of health care administrative databases in Canada. In: Goel V, Williams JI, Anderson GM, et al., eds. Patterns of Health Care in Ontario, the ICES Practice Atlas. 2nd edn. Ottawa, ON: Canadian Medical Association, 1996:339–45. American Association on Intellectual and Developmental Disabilities. Intellectual disability: definition, classification, and systems of supports. 11th edn. Washington DC: American Association on Intellectual & Developmental Disabilities, 2011. Government of Ontario. Services and supports to promote the social inclusion of persons with developmental disabilities act. Toronto, ON: Government of Ontario, 2008.
. Validation of perinatal data in the discharge abstract database of the Canadian Institute for Health Information. Chronic Dis Can 2009;29:96–100.
. Birth outcomes by neighbourhood income and recent immigration to Toronto. Health Rep 2007;18:21–30. Contributors All authors contributed to the conception and design of the study. HKB conducted the literature review and analyses and drafted the manuscript, under the supervision of SNV. YAK, VC, YL, and SNV reviewed the manuscript and revised it critically for intellectual content. All authors approved the final version of the manuscript and agree to act as guarantors of the accuracy and integrity of this work. Funding This paper was funded by the Ministry of Health and Long Term Care Health Services Research Fund program award (Ministry Grant #06671) and is part of the Health Care Access Research and Developmental Disabilities (H-CARDD) Program. In addition, this paper was supported by the Institute for Clinical Evaluative Sciences, which is funded by an annual grant from the Ontario Ministry of Health and Long Term Care. The first author is funded by a Canadian Institutes of Health Research Postdoctoral Award (MFE-135409). Ethics approval Ethics approval was obtained from the Sunnybrook Health Sciences Centre Research Ethics Board (Institute for Clinical Evaluative Sciences logged study 2014-0900-522-000). Data sharing statement The data housed at the Institute for Clinical Evaluative Sciences (ICES) are available to ICES scientists and those working in collaboration with an ICES scientist through several hubs across Ontario. Disclaimer The opinions, results and conclusions reported in this paper are those of the authors and are not necessarily those of the funding sources or data providers. No endorsement by the Ontario Ministry of Health and Long Term Care, Ministry of Community and Social Services, or the Institute for Clinical Evaluative Sciences is intended or should be inferred. Parts of this material are based on data and information compiled and provided by the Canadian Institute for Health Information (CIHI). However, the analyses, conclusions, opinions, and statements expressed herein are those of the author and not necessarily those of CIHI. The opinions, results and conclusions reported in this paper are those of the authors and are not necessarily those of the funding sources or data providers. No endorsement by the Ontario Ministry of Health and Long Term Care, Ministry of Community and Social Services, or the Institute for Clinical Evaluative Sciences is intended or should be inferred. Parts of this material are based on data and information compiled and provided by the Canadian Institute for Health Information (CIHI). However, the analyses, conclusions, opinions, and statements expressed herein are those of the author and not necessarily those of CIHI.